in the Global Health Agenda? The Asia Cancer Forum has been engaging with the global healthcommunity to share information about the current challenges forcancer in developing countries and to discuss future trends.Discussions also focus on how we can enhance communicationand cooperate in improving the global health status. It is our intention to position our agenda as an item to beincluded within the next Millennium Development Goals (MDGs)of the United Nations. The starting point of the debates within the Asia Cancer Forumis the concept of human security. Based on the concept of humansecurity, we are discussing the following questions: What shouldwe do to achieve this goal? And, further, what items should beadded to the revised MDGs? Session 1: What will shape the global health agenda? 12:25 The Challenges in The Global Health. 12:40 Cancer as a Global Health Agenda. 12:50 How could the issue of cancer be justified as a global health agenda? 13:15 Research platform to formulate cancer prevention strategies in Asian-region. Session 2: Where are we really? What activity can we do against Health Equity? Role of Traditional Medicine for Cancer Patients. Session 3: What should be incorporated in future agendas? 14:05 Health information in my hand. 14:10 Cancer: from Personal to Societal. The Chal lenges of Cancer Prevention in China. Expanding Need of Cancer Medicine in Asia. 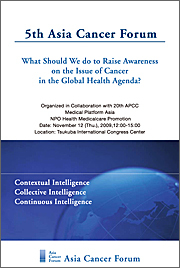 COPYRIGHT©2008 Asia Cancer Forum All rights reserved.